Concurrently with our name change, JCBT has expanded significantly. 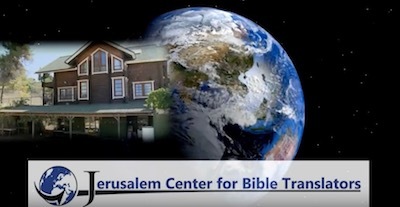 We had been considering a name change to reflect our expanding work and after several considerations and advise from our colleagues and Advisory Board we decided on: Jerusalem Center for Bible Translators, with the subtitle retaining our “brand” name: The Home for Bible Translators – an accredited Hebrew University program since 1995. The idea was “from Jerusalem to the ends of the earth.” The curved arrow points to Jerusalem – so critically located between Europe, Asia, and Africa. The long straight line is reaching out to the world, to “all families of the earth,” as was the blessing to Abraham given by God in Gen. 12. We are increasingly thankful and awed at the growing acknowledgement of the service which JCBT is providing in the Bible translation world. 96 Bible consultants and translators participated in our special short term course on the Context of the Biblical Text in 2016 alone. Recent discussions lead to a cooperative agreement with the United Bible Societies to provide training for their members in several courses in 2017. All this to say that the “Home” is indeed expanding into the “Jerusalem Center”! With your prayers and support this far-reaching impact is made possible!